From the creators of the groundbreaking documentary comes the New York Times bestselling diet plan Sanjay Gupta called “the prescription you need to live a long, healthy life”—a plan to transition to a delicious whole-foods, plant-based diet in just twenty-eight days. The trailblazing film Forks Over Knives helped spark a medical and nutritional revolution. Backed by scientific research, the film’s doctors and expert researchers made a radical but convincing case that modern diseases can be prevented and often reversed by leaving meat, dairy, and highly refined foods off the plate and adopting a whole-food, plant-based diet instead. Now, The Forks Over Knives Plan shows you how to put this life-saving, delicious diet into practice in your own life. This easy-to-follow, meal-by-meal makeover is the approach Doctors Alona Pulde and Matthew Lederman (featured in the documentary) use every day in their nutritional health practice—a simple plan that focuses on hearty comfort foods and does not involve portion control or worrying about obtaining single nutrients like protein and calcium. In just four short weeks you’ll learn how to stock your refrigerator, plan meals, combat cravings, and discover all the tips and tricks you’ll need to eat on the go and snack healthily. You’ll also get 100 simple, tasty recipes to keep you on the right track, beautiful photographs, a 28-day eating guide, and advice throughout the book from people just like you. Whether you’re already a convert and just want a dietary reboot, or you’re trying a plant-based diet for the first time, The Forks Over Knives Plan makes it easier than ever to transition to this healthiest way of eating…and to maintain it for life. In the spring of 2009, we received a very interesting phone call. On the line was Brian Wendel, who said he was making a film on the power to prevent and treat chronic disease with a whole-food, plant-based diet. He turned to us because we were running our medical practice using this diet as a primary treatment. Brian wanted to show an audience how patients suffering from serious chronic conditions can, with relative ease and in a short time, turn around their difficult situations and achieve true health and vitality—just by eating well. Given our experience and training in lifestyle medicine, we were confident in this approach. We knew the power of this way of eating and were eager to help in whatever way we could to introduce its significant promise to a wide audience. And so without hesitation, we agreed. The film Forks Over Knives was released in theaters and on home video in 2011. The responses of audiences worldwide surpassed our best hopes for its reach and influence. The food-as-medicine concept is now reaching millions of people and the movement is growing stronger each day. The movement’s popularity is driven by one important factor: The lifestyle works! More and more people are learning that a diet based in fruits, vegetables, tubers, whole grains, and legumes intervene makes all the difference when it comes to achieving good health . . . and the word is spreading in a big way. 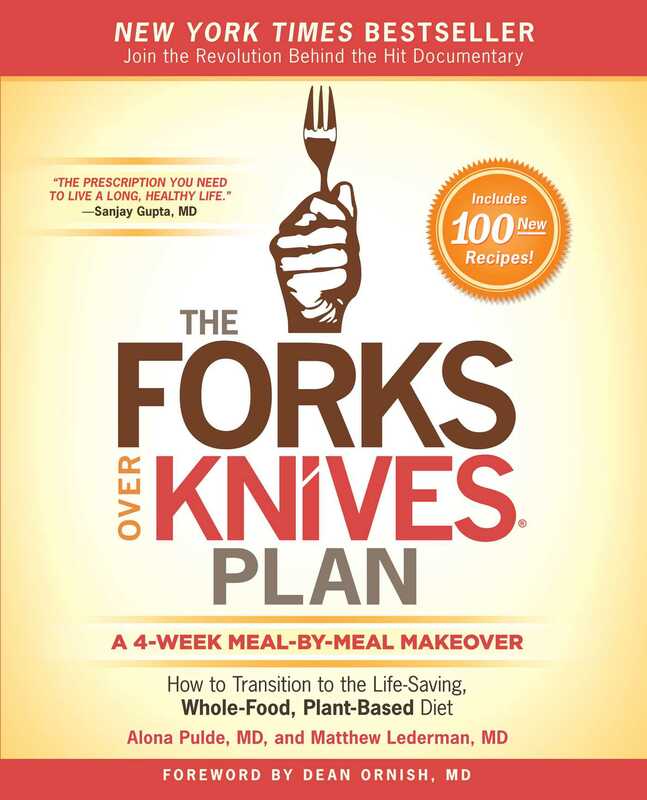 Nearly five years after our involvement in the documentary, we are thrilled to have teamed up with Forks Over Knives again—this time to provide this four-week transition guide. In this book, we bring you the specifics of the Forks Over Knives philosophy and guide you through an A-to-Z transition so you can live the whole-food, plant-based way for a lifetime. Among other things, we detail what a whole-food, plant-based diet is and is not—and you’ll see that this means you will be living on food that is not only healthy, but also hearty and satisfying. We show you how to survive and thrive on the foods you love—like pancakes, burritos, mashed potatoes, and lasagna—and at the same time, get all the nutrition you need. People seek dietary changes for various reasons, whether it’s to become healthier, lose weight, improve athletic performance, or just feel better. Regardless of the reasons for wanting a change, you are probably looking for a better result than you are getting now. Many diets fail because they tend to be nothing more than variations of the Standard American Diet. That is, they basically require a reshuffling of the same animal-based foods—oftentimes in order to meet target goals for certain individual nutrients, such as protein, calcium, or omega-3. They also tend to follow similar principles, such as counting calories or even purchasing supplements from the diet’s author. On the other hand, when you adopt the Forks Over Knives way of living, you will be trying something completely different. You will not be eating for single nutrients, counting calories, or buying supplements from us. Instead, you will simply focus on eating the whole, plant-based foods you enjoy. Though the food you’ll eat is neither unfamiliar nor exotic, the composition of your plate of food will change substantially—so much so, in fact, that the lifestyle achieves something unlike anything else out there. The hallmark of the whole-food, plant-based lifestyle is its unique ability to prevent, halt, and even treat chronic illness, such as heart disease and type 2 diabetes. The changes it can bring to your life are often rapid and measurable. Matthew Lederman, MD, is a board-certified internal medicine physician specializing in nutrition and lifestyle medicine. He lectures for the eCornell T. Colin Campbell Certificate Program in Plant Based Nutrition and appeared in the films Healing Cancer From the Inside Out and Forks Over Knives. Along with Alona Pulde, he cofounded Transition to Health: Medical, Nutrition, and Wellness Center and coauthored Keep It Simple, Keep It Whole and The Forks Over Knives Plan. Is Modern Medicine Making Us Sick? "Drs. Alona Pulde and Matthew Lederman are extraordinary pioneers, leaders, and healers who represent the future of medicine." "Drs. Alona Pulde and Matthew Lederman have forged the bedrock foundation for successful plant-based nutrition in their Forks Over Knives Plan, which may reestablish a healthy America." "Forks Over Knives truly changed my life, and it also changed my entire perspective on eating habits. … I encourage everyone to try out the recipes in the book and be open-minded to all of its possibilities. If you have your health, you really have it all." "You are about to be blown away by how well this step-by-step plan works. It is simple, affordable, medically sound, and people tested. Read these pages, start leaning in to the suggestions, and expect nothing less than a profound physical transformation!" "The Forks Over Knives Plan is comprehensive, pragmatic, and beautifully simple. A big plant-strong thumbs up!" "Dive into a deeper understanding of how you can eat for health—complete with delicious whole-foods recipes!" "Drs. Pulde and Lederman have written an easy-to-follow four-week prescription to better health. Get it, read it, do it." “Eating plants revolutionized every aspect of my life for the better. It worked for me and I promise it will work for you too.So do yourself and your loved ones a favor and get this book!" "As a plant-based athlete for twenty years, The Forks Over Knives Plan is the by far the best program I have followed to achieve optimal results in health and fitness." "This book is an absolute jewel! In just a few days, you can feel a growing confidence and excitement as you follow these stepping stones to the life you deserve." "Those new to the plan may be surprised that portion control is out the window; because, as the authors point out, plant-based foods have a lower calorie density, larger portions are required to maintain satiety (without weight gain). This is a worthy addition to the growing Forks over Knives library."